Sometimes I wrongly base my maternal success on silly standards I set for myself, such as the number of veggies my family eats. Whatever the motive, I’m spurred into trying creative ways of “hiding” a serving of vegetables in my kids’ preferred mundane world of nuggets, crackers, and peanut butter. Let’s be real for a moment: the recipes that eliminate all butter/sugar/goodness make us all wish for a real, avocado-free cookie. As with everything in life, it’s about balance. My kids aren’t going to wake up tomorrow and beg for a broccoli-quiche breakfast, and that’s okay. My job is to keep trying, and every now and then be satisfied with adding some extra nutrition into their diets in yummy, fun ways. After multiple attempts to trick the most discerning taste buds, it actually worked! 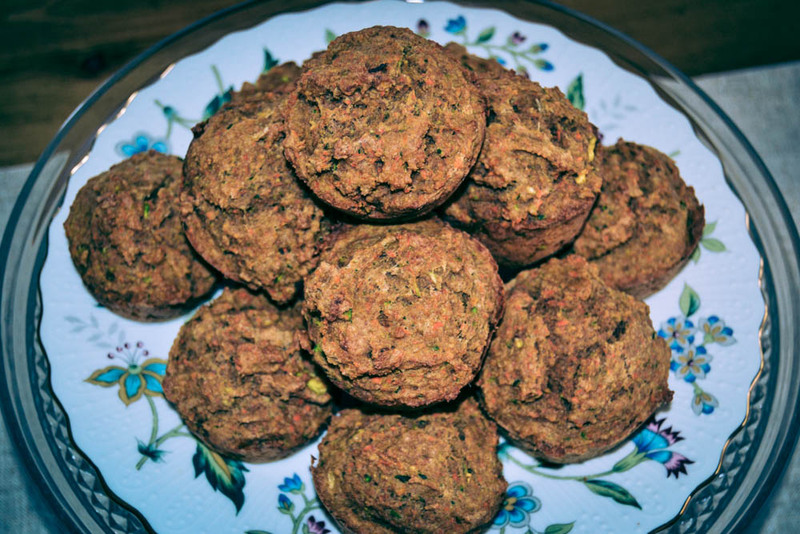 Mother, father , and babies agree: veggie muffins taste like real muffins. Success story? Sure! However, let’s not forget that the true successes of motherhood are in the moments… not the muffins. There is nothing better for man than to eat, drink, and enjoy his work. I have seen that even this is from God’s hand, because who can eat and who can enjoy life apart from Him? 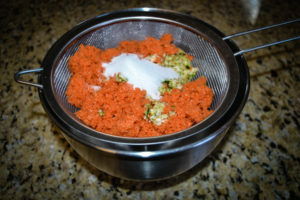 Start by grating by hand or using a food processor to finely shred carrots and zucchini. 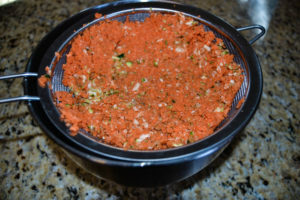 Place shredded veggies in a strainer and then add white sugar. Combine. Some sugar will immediately fall through the strainer as you stir it in, and that’s fine. The sugar will begin to draw the water out of the vegetables. 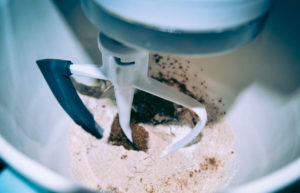 Intermittently throughout the prepping process, you’ll want to stir this mixture around and “press” the water out. 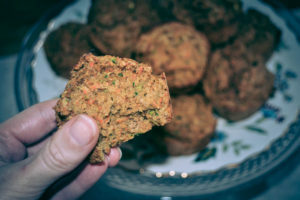 To judge your progress: by the time I was ready to add the veggies to my muffin mix, nearly 1/4 cup of water had been pressed out, but this will vary depending upon the vegetables’ freshness. It’s starting to smell like muffins and not a salad! Not pictured: adding and combining the wet ingredients prior to adding the vegetables. You get the idea, right? 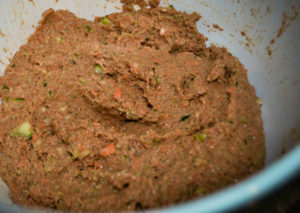 Make sure you give those veggies once last stir and press before adding to mixture. Bake and serve as a snack, breakfast, or whenever! Yum! Preheat oven to 350 degrees Fahrenheit. Shred vegetables. In a strainer, add white sugar. 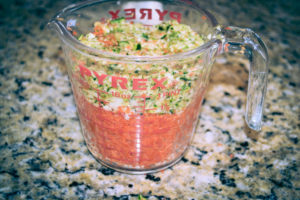 Combine and intermittently throughout the preparation process, stir and press out the water from the vegetables. 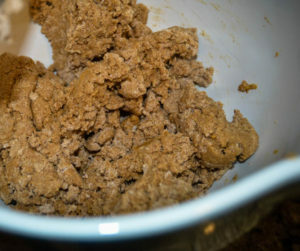 Combine dry ingredients into large bowl. Add banana. 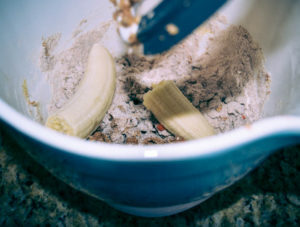 Combine wet ingredients into large bowl and then incorporate into the dry/banana mixture. 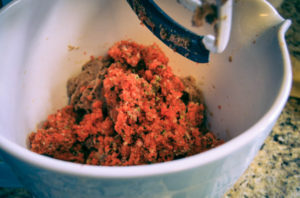 After a final press of the veggies, add them to the muffin mix. Combine well. 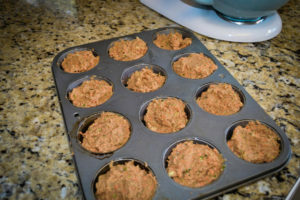 Fill a greased muffin pan with muffin mixture. Bake 21-23 minutes or until inserted knife or toothpick removes cleanly. Let cool and serve to even the choosiest of tasters. Yield: 12 muffins.